By Maverick Fantana: Boxing said farewell to Money Mayweather after a dominant and very exciting final display of boxing prowess against Andre Berto. With Manny Pacquiao back from his amazingly long retirement there is of course speculation that a rematch with Floyd Mayweather could be in the works. Mayweather has quashed any rumours of a return to the ring much like he did throughout his career with overmatched opponents. That is except for the recent speculation and comments from Floyd saying he will fight MMA and soon to be Game of Thrones star Gregory McConnor (who is not yet a household name). The fact that cage fighters want a piece of Floyd is evidence of his still massive pull across multiple sports. While no one has taken up the mantle Floyd left since his retirement we have seen some exciting fights inside the squared ring. The historic win of Tyson Fury vs whichever Klitschko it was he won the title from would have probably led to Fury being the man in boxing, but then he had a breakdown. Anthony Joshua will likely knockout Klitschko and this will get him up there as a global superstar. There is also Mexican favourite Canelo best known for that lucky punch he landed against the far superior Khan but his reluctance to fight Golovkin cannot be ignored. GGG is clearly the pound for pound king at the moment with his great win over Brit Kell Brook and he has a huge fanbase but I don’t think anyone sparks interest like Money Mayweather, that is except of course for Gregory McConnor (not a household name yet), who doesn’t even box. So is boxing missing its former number one star? Although he may have upset more people than a Donald Trump presidential win with such talent you have to make exceptions for Mayweather, much like WADA did with the IV drips. Why is Floyd named constantly by guys who don’t even box? What made him so special? Well, like a rubik’s Cube the defensive mastery of Mayweather was never solved, and never will be. He fine-tuned the art of hitting without getting hit that he became as insurmountable as Moel Famau in North Wales. Opponents just could not land clean punches on Mayweather, he controlled range so much so that he may well have been on the moon (if it were a place man could get to). With his fast hands and counter punching technique he would create so much distance from the man in the ring with him even Chris Kyle would have had a hard time getting a clean shot. With such great combination punches even the hardened Canelo could not walk through Mayweather who punished his every mistake much like a divorce court punishes a man for getting married in Western society. Throughout his 19-year professional career Floyd Mayweather was able to remain fresh and basically look the same never seeming to age, a bit like a McDonald’s burger left in a wardrobe for years. It wasn’t just his defense and counterpunching abilities that made him such an attraction. He had real KO power in both hands – as witnessed by the devastating KO of an apologising, unaware and defenceless Ortiz. Also who can forget the bloody nose he gave to the literal giant Big Show? Mayweather was admired because of his ruthless desire to win at all costs and had a bad boy demeanour that a man can only get by serving 30 days behind bars, for beating a woman. His ring walks were unique and inspiring to many, often seen entering with the gender fluid Justin Bieber. He walked into the ring with an indomitable air of supreme confidence and I believe his confidence obviously rubbed off on Floyd Mayweather, making him even better. If McConnor (who is not yet a household name) is going to fight in the boxing ring he needs to be aware that Mayweather had impeccable timing the likes of which had never been seen, which is why he was able to get Pacquiao when he was old and past it. On saying that it cannot be overlooked that Mayweather absolutely outclassed Canelo and took him into deep water, which was particularly harsh on Alvarez as he was so thirsty and weight drained. His winning ways made him so popular with non-boxing fans it is bizarre to believe he was voted out of Dancing with the Stars in the early stages. This is why the MMA fans want to see their best ever, Gregory McConnor (not a household name yet) fight the ferocious Floyd. It was this massive popularity which made Mayweather an absolute fortune, more than even a single mother on state benefits and CSA. He had real star attraction, especially to gold digging hookers he was always seen hanging around with. With his winning ways and ability to get himself the highest purses ever for prize fighting Mayweather had unstoppable momentum like a climate change graph. He crusaded for a safer boxing environment, one with equality and no drugs cheats. It can be said that Floyd Mayweather single-handedly cleaned up the sport of boxing from PEDs all done whilst in the comfort of his own home having IV drips in both arms. He raised the issue of drugs in boxing so well that for most people the words boxing and PED users are synonymous with Mayweather. Will Mayweather ever return and grace fans with another boxing foray to try and get to 50 and 0 versus Gregory McConnor (who is not as yet a household name)? With the amount of money he made in his career he certainly isn’t going to do it for financial incentives alone especially when he remains so frugal with his money and invests it wisely on things like two million dollar watches. The $25 million dollars he laughed at offered to him by Dana White is testament that Floyd is all about legacy. Which proves what a great guy he is, like the time he flew a 19 year old British hottie around the world with him on tour and didn’t even shag her. Thankfully for all concerned Floyd Mayweather is a unique case in boxing and whilst he is sorely missed boxing and maybe even MMA still has many stars and rising superstars who fill any void Floyd left behind. About the author – Maverick Fantana lives in the UK with his Mom and is currently looking to get a pet piglet. 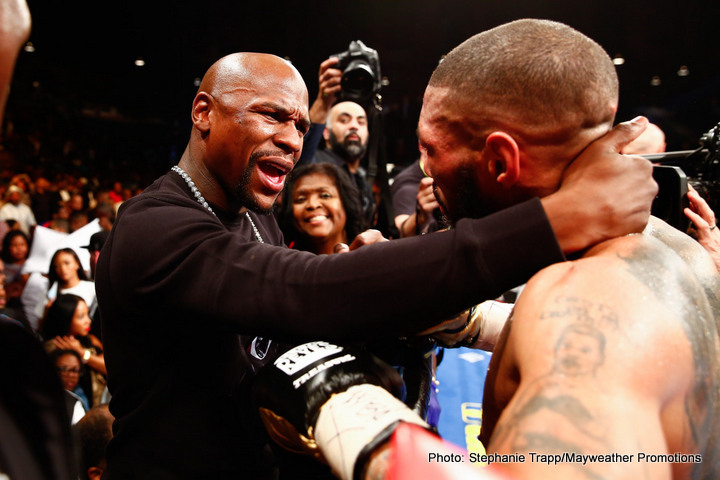 You are here: Home / Boxing News / Is Floyd Mayweather Jr still the biggest name in boxing and MMA?